The sun is shining, the birds are chirping and now you can clearly see the amount of dust that has built up throughout your home. That doesn’t even begin to cover how much stuff you let pile up in your home through winter—Christmas brought new gifts, but you forgot to get rid of the old, so now you just have twice as much cluttering up each room. Spring fever is beginning and you’ve got the itch to clean out the clutter and get your home back into tiptop shape. One thing that may not cross your mind as you clear out the old stuff and make room for the new fresh air is recycling. We’re all guilty of getting a little too hasty. Once you start piling up the garbage bags of junk, it’s hard to stop. You don’t give yourself the extra time to sort through the items and bring them to a recycling center. But that’s a simple shift, an easy change to make as you work through your own spring cleaning this year. Take a few of our tips, pry open those windows and go green while you spring clean. As we’ve already mentioned, hastiness can be dangerous. You get the cleaning twinkle in your eye and everyone knows that it’s time to get out of your way while you clear out the home and create a fresh space to match the spring weather. But it’s time to step away from the “throw it away” mentality. While you clean, you have the responsibility to not only clear out your home but to also do it sustainably. As you examine each item, preparing to say goodbye to it, ask yourself, “Is this really un-salvageable?” If you can imagine the item being reused, then you’d be better off saving it to donate locally. If you can’t imagine it having a new life without you, consider what kind of recycling bin it would belong in. You’d be surprised by the amount of paper that ends up in the landfill by people who clean too hastily. Maybe you need someone to keep your waste management style in check. Or perhaps instead, you’d be better off just holding on to the go green, spring cleaning mentality. However you choose to do it, always be sure that you give each item leaving your home a long, hard look. If you’ve got a type A personality, organizing your cleaning and recycling is no big deal. You’ve got it covered without the extra tips. But if you’re anyone else, you could probably use an extra hand. Before you bring everything to a recycling center, you need to sort through the items you’re getting rid of. Too often we hold onto things that aren’t important. You keep an outfit that you only wore once or you hold onto a CD collection that you haven’t touched in decades. As hard as it may be to part with the memorabilia, you need to let it go—you need to consider recycling. Set up piles in your home or in your yard, depending on how clear your spring weather is. Each of these piles will be titled something along the lines of “keep”, “donate”, “recycle”, or “throw away”. Pull the things that take up space in the back of your closet and think long and hard about the last time you used them. If you can’t picture it or think of a time you’ll be using it any time soon, it’s time to let it go. You’ve also probably got piles of credit card offers and junk mail that you’ve ben holding onto. We all do it. You imagine that you’re going to take them in with the rest of your recycling, but you haven’t had a chance to shred them or get them out of your home. Now is a prime opportunity to remove yourself from mailing lists. These papers end up strewn across your home and filling up your mailbox—take action to get rid of them for good. As you move through the rest of your home, you’ll be astounded at how much you’ve kept over the years, unnecessarily. It’s hard to promise that you’ll never do something again. But do your best to keep this “keep”, “donate”, “recycle” or “throw away” waste management technique with you year round. One of the best parts of spring cleaning are the places that don’t often get cleaned will now become the pride of your home. There are walls that will be washed and corners of the floor that will finally see the sun. Before you pull out the paper towels and bleach, remember to go green. This means that you can ditch the paper towels and instead substitute them for some old rags. That’s the prime opportunity to get an extra use out of those unsalvageable tshirts that you were about to throw away. People who stick with the paper towel method will find that at the end of the day, they’ve got a garbage bag full of paper towels and there’s no way that they can go into your recycling bin. Try to avoid buying new garbage bags for the event as well. If you’ve got old shopping bags or grocery bags laying around your home, this is the prime time to pull them out and put them to good use one more time—the cornerstone of a good recycling plan. Before you douse your home in the maximum strength cleaner that you found at the local mega store, try to consider what these unnatural chemicals are doing to the inside of your home. If you wouldn’t feel comfortable letting a child on the floor that this once cleaned, you shouldn’t be spring cleaning with them. That isn’t even considering what this stuff can do to the environment. Try to find natural chemicals in the aisles of your local grocers, chemicals that make it easier to go green. These cleaners will get the job done and do so safely, keeping your family happy and healthy all year long. The need for recycling has never been more important than it is now. However, the need for affordable, donated goods is getting up there. You’ve gathered up the items in your yard under the “donate” sign and it’s time to give them new life instead of condemning them to the junkyard. Aside from recycling, donating old items is the perfect way to get rid of more while creating less waste. Take your lightly used clothes that you no longer care about or no longer wear, and bring them to your local Goodwill or Salvation Army. Watch for fundraisers in the neighborhood. Kids will often have competitions of who can bring in the most donated items—what a way to become somebody’s hero. Go through your library. Are there books that you haven’t read or are never planning on reading? They’ve probably collected dust since you brought them home. Gather them up and pass them on to a school to boost their library. Who knew that recycling could feel so good? Take some extra time to go through your kitchen cabinets. Pull out the old pots and pans that you won’t ever use again. Grab the extra Tupperware that seems to sit in the bottom of the drawer. If you can’t find ways to use them around the house, then use your new green waste management skills. Give them a new life with a couple of newlyweds; donate them to your local shelter. Depending on whom you’re donating to, some organizations will go out of their way to do curbside pickup. This makes it even easier for you. Far too many of us have great intentions and then keep the items until they need to be thrown out once more. Do your research and find out how going green can be easy. Though it’s called the big trip, you’re probably not going to take your waste to one big recycling plant. Instead, you’re going to have to make several trips depending on the items you’ve had inside of your home all year. Like most people, you probably have mountains of untouched, outdated tech. Whether it’s CD’s, VHS tapes or old DVD players, you’ll need to make sure they’re taken care of properly. Call your local electronics stores and find out how to get them out of your home responsibly through their tech recycling program. If you’re getting rid of old glass, you’ll need the proper bin (something that many homes lack). Post on a public forum like Facebook to find where these goods can go. If it’s plastic bottles or paper, put it in your own bin. It’s hard to beat the feeling of accomplishment that comes when mounds of full garbage bags sit outside of your home along the sidewalk. 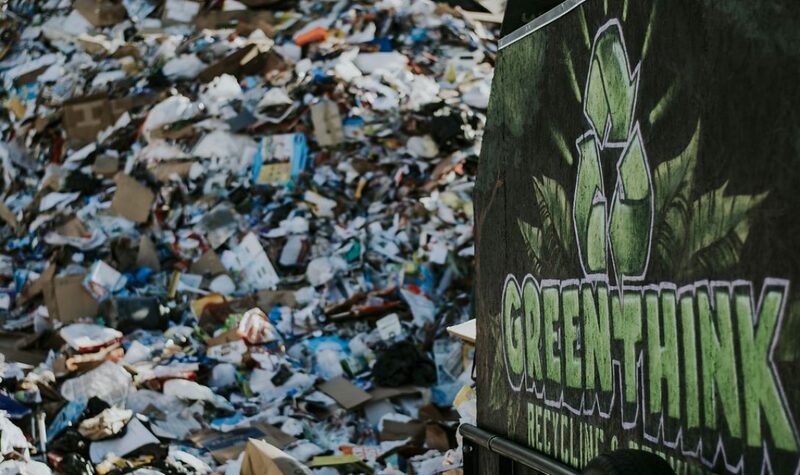 But if you maintained a recycling and go green mentality all year round, you wouldn’t have to deal with the build up that comes from too much clutter. As you’re going through your home, cleaning out the unnecessary items, try to find places that would be perfect for extra recycling bins. What methods can you work into your family’s routine to de-clutter throughout the year? Maybe it’s recycling one item when you bring a new one home. Or maybe it’s simply being more mindful until spring rolls around. However you do it, just remember go green while you spring clean.